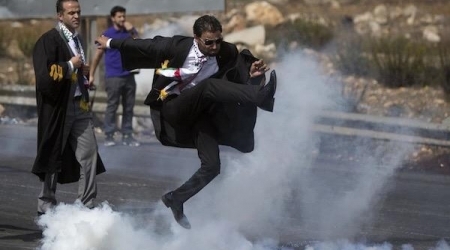 One of the most memorable images of the current Israeli-Palestinian confrontations shows young Palestinian lawyer Hassan Ajaj in dark shades, a suit and formal legal robe as he kicks away an Israeli tear gas canister, his legs flying high above billowing white gas.According to Al Ray, the Associated Press photographer’s image received over 1.8 million views on one photo-sharing site alone, mostly due to the fact that Palestinians clashing with Israeli soldiers are typically masked stone-throwers in scruffy jeans, not nattily dressed professionals. ‘It shows that as a Palestinian lawyer, I am part of my people, part of the Palestinian wish for liberation,’ said Ajaj in interview with AP. Ajaj believes his generation is different from the one that rose up against occupation in the late 1980s, since young Palestinians nowadays tend to be more educated than their parents. More than 222,000 currently attend colleges and universities, or double what it was just a decade ago, out of 4.4 million people in the West Bank, Gaza Strip and east Jerusalem, the lands Israel occupied in 1967. On Oct. 12, dozens of members of the Palestinian Bar Association marched from the Ramallah courthouse to the traffic circle for what Ajaj said was a peaceful march, without stone-throwing. Male and female participants wore formal attire, including suits and black court robes. Israeli soldiers fired stun grenades and tear gas to stop the lawyers from advancing, said Ajaj. Some of the marchers were overcome by tear gas. His now famous punt was spontaneous. ‘I just wanted to kick it (the tear gas) away,’ he said. Four days later, the popular Buzzfeed website said the image had been turned into a ‘huge meme’ by users in a photo shop competition. Doctored photos portrayed him as a hurdler, rock star, dancer and field goal kicker. ‘We are lawyers, we don’t throw stones,’ he said, but added that he believes stone throwers have a role to play. He said he won’t condemn those who carry out stabbing attacks, arguing that they were driven to such acts by Israeli measures, such as land confiscations and movement restrictions. ‘People are rightfully engaging in demonstrations and civil unrest, but sadly without a path to get them to an end of the occupation,’ he said.